world this time? Find out by watching Power Rangers Wild Force. An ancient jungle tribe hosts a cerimony to bid farewell to Cole who has now become of age and must venture out to seek his own path. The tribe leader gives him the items that were found with him, when they found him as a baby. It is a picture of some people and a red crystal. As Cole ventures out to the big city of Turtle Cove, a battle endures in the heart of the city. Four heroes in colored armor raise up to fight against two demonic creatures called the Org. The White Ranger appears and attacks the Org with a Battle Baton. The Yellow Ranger jumps into the air and spreads out her wings and attacks with a Golden Sword. The Blue Ranger battles an Org into the water with his Fighting Fins. Back on the land, the Black Ranger battles the Org with a Battle Axe. As these Power Rangers start to weaken, the Org laugh at them and disapear. They power down and we see their human form. The Black Ranger points out that it has been the first time they've had to battle two Org at once before. The White Ranger agrees and points out that they need more help. The Yellow Ranger is perfectly content with the way things are and assures them as their leader, that things are fine the way the they are. Meanwhile, Cole searches for the people in the picture. He finds a dog and begins to talk to him. Nearby, an animal shelter's truck is parked and a male and a female grab the dog. Cole follows the truck to the animal shelter, where he breaks in and releases all the animals. The two animal catchers chase him out and threatens him to never to return. The male, Jindrax tells the female Toxica, that he misses the old days, when the Org reigned supreme. Just then, they see an Org pass by. Jindrax and Toxica reveal their true forms and prepare to follow the Org. Meanwhile in front of a sacred water pool, a beautiful princess watches Cole as he frees the animals. She calls for the Rangers and tells them she may have the answer to their problems. Later the next morning, Cole is waked on a park bench by the four humans that are the Rangers. They try to convince him to come with them to save the world. The Yellow Ranger resorts to her own methods and knocks him unconcious. Later, Cole awakens to find himself on a floating island, surrounded by giant Power Animals. A gigantic red lion communicates with him and tells him that he has been looking for him. Cole pulls out his red crystal, where he sees the red lion inside. He is then greeted by Princess Shayla, who introduces herself and welcomes to the floating island, the Animarium. She introduces the Wild Force Rangers as well. Alyssa is the White Ranger. Taylor is the Yellow Ranger. Max is the Blue Ranger. 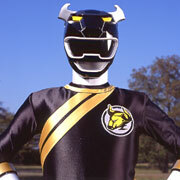 Danny is the Black Ranger. Princess Shayla tells Cole that he has been chosen to become the Red Ranger, the leader of the Power Rangers Wild Force. Cole relizes that it must be his destiny and the five Rangers prepare for battle. After Cole is given a Growl Phone, the five Rangers morph into the Wild Force Rangers. The Wild Force Rangers use their Crystal Sabers and their special weapons to fight the two Org. The White Ranger battles with her Battle Baton. The Yellow Ranger duels with her Golden Sword. The Blue Ranger fights with his Fighting Fins. The Black Ranger engages in battle with his Battle Axe. The Red Ranger attacks with his Lion Fang. The Wild Force Rangers combine their weapons to create the Jungle Sword. They power up the Jungle Sword and destroy the Plug Org with the Savage Slash attack. 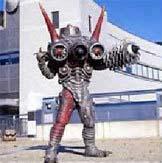 Meanwhile, Jindrax and Toxica appear and give the Turbine Org the ability to grow. The Rangers are suprised because the Org have never got that big before. Meanwhile, Princess Shayla summons the Rangers through the sacred pool and tell them to insert their crystals into their Crystal Sabers and summon the Wildzords. The White Ranger summons the Tiger Wildzord. The Yellow Ranger calls upon the Eagle Wildzord. The Blue Ranger activates the Shark Wildzord. The Black Ranger raises up the Bison Wildzord. The Red Ranger brings out the Lion Wildzord. With the power of the Crystal Sabers, the Wild Force Rangers are able to activate the Wildzords and use them to  destroy the Turbine Org. A new team has been brought together to fight against evil. They are the Power Rangers Wild Force. As Cole adjusts to his new environment on the Animarium, Shayla alerts all the Rangers that another Org has been born. As the Wild Force rush to the fight, Cole insists that he must try to reason with the Org. For you see, it is just like an animal that has been driven from its home. Every living thing has a heart. Meanwhile, Jindrax and Toxica journey down a staircase into the heart of the Nexus. The Nexus has been sealed ever since the great war 3,000 years ago. But now it is open, and they are greeted by Master Org. Although, they thought he was destroyed, he's alive and well and informs them what that the Org are slowly being reborn and getting stronger. Jindrax and Toxica seek out the new Barbed Wire Org. The Barbed Wire Org identifies Jindrax and Toxica as Duke Org. They give him a silver goblet full of purple ooze and then they give him the orders of Master Org and then they leave. Meanwhile, Cole is trying to convince the other Rangers of his plan to reach the Org. Taylor turns down his idea and she, Max, and Danny leave to find the Org. Alyssa stays behind with him to keep an eye on him. She tries to convince him by telling him how long they have been Wild Force Rangers. Danny is still new with two months of being a Ranger. Alyssa and Max have been both been Rangers for sixth months. But Taylor has been one for a year now. She knows how to deal with them. But Cole is sure that he can reach the Barbed Wire Org. Barbed Wire Org takes out the goblet and pours it onto the ground, calling out the Putrids, minions of evil. Cole and Alyssa fight the Putrids and Cole tries to reach Barbed Wire Org. Cole listens to him, as Barbed Wire Org just stares back at him, in utter confusion. Then Cole stops and is amazed that he hears nothing. The Org do not have a heart. When Barbed Wire Org relizes that is what he wanted, he laughs at him. Just then, the other three Rangers arrive on the scene. Danny is loyal as he tries to help up his leader who has been knocked to the ground. Taylor looks to Cole and asks him what he's going to do now that he's the leader. Cole finally agrees that fighting is the only way to deal with the Org. They use their Growl Phones to morph into the Wild Force Rangers. They battle the Barbed Wire Org with their weapons. Then they combine them to create the Jungle Sword. The Wild Force Rangers use the Jungle Sword to destroy Barbed Wire Org. They celebrate over their victory until they meet Jindrax and Toxica. Jindrax introduces himself as the Duke of Org, and master of blades. Toxica introduces herself as the Dutchess of Org, and the mystress of magic. They are not like the Org they have encountered in the past. So that's where the Org are getting their power. Toxica raises her staff and shoots out seeds into the slime that remains of Barbed Wire Org. She calls for the fallen Org to be reborn with more power. Vines grow from the slime into a giant Barbed Wire Org. So that's how they did it. The Wild Force Rangers call upon their Wildzords. When Barbed Wire Org overpowers the Wildzords, the Lion speaks to the Red Ranger. 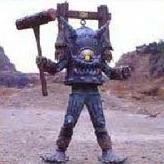 They call for the Wildzords to combine and they enter the head of the Lion Wildzord. 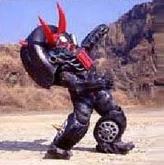 The brain evolves into a cockpit and the Wildzords create the Wild Force Megazord. The Wild Force Megazord attacks with the Fin Blade. Then it uses its fists to perform Tiger Fury and Shark Surge. Then inside the cockpit, the Rangers place their Crystal Sabers into molds in front of them. They combine their powers and the Wild Force Megazord performs the Mega Roar, where a rainbow of energy and their animal spirits shoots out from it and destroys the Barbed Wire Org. Meanwhile inside the Nexus, Master Org is furious, but swears that the Rangers will be in for a suprise. Later on the Animarium, Shayla and the other Rangers clean Cole up and give him his own jacket. They each have their own. Alyssa's jacket is labeled "Noble Tiger", Taylor's jacket is labeled "Soaring Eagle", Max's jacket is labeled "Surging Shark", Danny's jacket is labeled "Iron Bison, and now Cole's jacket is labeled "Blazing Lion". Welcome to the team, Cole. Taylor makes sure Cole studies the rule book of being a Ranger. She is very insulted when Cole points out they don't need so many rules. He says the only rule they need is teamwork. Meanwhile, as Taylor goes out to cool off, Princess Shayla tells the Rangers her story. 3,000 years ago, humans and animals lived in peace in the quaint city of Animaria. This is until an evil emerges known as Master Org. He unleashes the pollution of the Org on Animaria. Five ancient warriors gather together to defeat the Org. In the midst of the battle, Shayla is chosen to perserve the beauty of the land by sending a piece of Animaria up into the sky creating the Animarium. Shayla is put into a 3,000 year rest as the great Power Animals watch over her. While the Animarium was sent off, the ancient warriors were able to defeat the Org. But in the present day, the world has been overun by pollution, allowing the Org to be reborn. 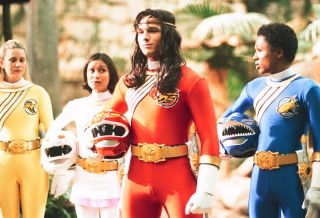 The legendary Power Animals chose the Wild Force Rangers to protect the Earth. And speaking of the Org, the Camera Org has just been born and he's capturing people's images and making them invisible. Taylor witnesses this and tries to stop the Org herself. The Yellow Ranger tracks down the Camera Org and encounters Jindrax and Toxica. Camera Org shows up and makes the Yellow Ranger invisible. Later, the other Rangers are able to get her back to the Animarium. Cole is convinced that it is his fault, due to what he said about her book. The Wild Force Rangers track the Camera Org down and retrieve his role, making everyone's images be restored including Taylor. Taylor returns to battle and transforms into the Yellow Ranger. Camera Org wraps the Rangers up in super strong film. They can't break free until the Red Ranger relizes he can make his Lion Fang evolve into the Lion Blaster. The Red Ranger uses the Lion Blaster to attack Camera Org and free the Rangers from his hold. The Wild Force Rangers combine their weapons to create the Jungle Sword. They use the Jungle Sword to destroy the Camera. Jindrax and Toxica show up and Toxica uses her staff to shoot out the seeds that make Camera Org grow. 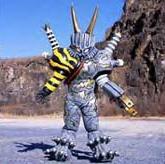 The Rangers call upon their Wildzords and combine them to create the Wild Force Megazord. The Wild Force Megazord uses the Mega Roar to destroy Camera once and for all. Later on the Animarium, I think the Rangers have relized the value of teamwork. Max and Danny are reading in the paper about a ghost in a temple uptown. Max is convinced that it is an Org, so he and Danny prepare to go find it. That is until Danny sees a girl at the flower shop. Danny is so happy to see Kendal, the girl who he worked with at the flower shop before he became the Black Ranger. Meanwhile, Max is upset that Danny forgot about him. That is when he takes off to find the Org himself. Max searches out the temple grounds when he sees something that is definitely an Org. The temple keeper comes outside and yells at him to get away and the Org escapes. Later back at the Animarium, the other Rangers tease him about thinking he seen the Org and they call him a kid. Max gets mad at Danny and tells him that if he would've been there with him, the others would believe him about the Org. Later that day, Danny agrees to go with Max to the temple, but when they are walking through the park, he sees Kendal drive by and takes off to talk to her. Max is upset and leaves without Danny. He gets to the temple where the old man is being driven out by the Bell Org. Max morphs into the Blue Ranger to fight the Bell Org, but he is no match for him. Max is powered down and his Growl Phone falls to the ground. Meanwhile at the Animarium, Princess Shayla alerts the Rangers of the new Org. The Wild Force Rangers find Max's Growl Phone and wonder where he is. Bell Org has him trapped up on the hill in a bell. Danny blames himself for letting this happen to Max. See, when Danny first became the Black Ranger, Max was there for him. Danny was afraid once, and almost fell to his doom. (Or so he thinks. I've seen Rangers fall from higher) However Max was there to save him and told him to never give up. The Black Ranger gets enraged and races up the hill to save Max. He uses his Battle Axe to free his friend. Max morphs into the Blue Ranger and the Wild Force Rangers form the Jungle Sword and destroy the Bell Org. Jindrax and Toxica show up and Toxica uses her enchantment seeds to make Bell Org be reborn as a giant. The Rangers call forth their Wildzords to descend from the Animarium and combine to create the Wild Force Megazord. Bell Org tries to trap them inside of another bell, but the Black Ranger calls for the Bison Kick to send the bells flying. The Wild Force Megazord uses the Mega Roar to destroy Bell Org once and for all. Later at the flower shop, Danny returns to tell Kendal how he feels. He even has the words written down, but they seem to escape him when he tries to talk to her. After he leaves, Kendal looks into the flowers and sees the paper Danny had written the words down on stashed there. She reads it and it says "I wanted to tell you how much I love you." Kendal smiles. Could this be the beginning of a beautiful friendship? Alyssa goes on a class trip with her archeolagy class to the mountains. She is looking in a cave when she hears what sounds like an elephant. She follows the sounds when she finds the emblem that appears on hers and other Rangers' belt buckles. She returns to the Animarium to talk to Princess Shayla about it. Shayla agrees to go with Alyssa to see what she's talking about. Cole offers to go as well, in case trouble arises. However, they're not the only ones that aware of this new discovery. Master Org is aware of it as well and sends the Tire Org to attack them. Tire Org transforms into a giant tire and rolls around the city and captures Princess Shayla inside and takes her to the cave where Master Org, Jindrax and Toxica are waiting. Alyssa and Cole alert the other Rangers of what has happened. The Wild Force Rangers chase after Tire Org as fast as they can, but the Tire is too fast for them. Just then, Cole hears the Lion Wildzord call to him. 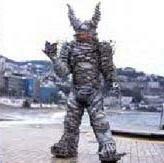 The Wildzords come down from the Animarium and transform into the Savage Cycles. The Savage Cycles are beautiful and are driven by the spirits of the Wildzords. The Wild Force Rangers rev up the Savage Cycles. The Red Ranger has some trouble with his. See, there are no animals like this in the jungle but luckily the White Ranger helps him out. The Wild Force Rangers chase down Tire Org on their Savage Cycles. The White Ranger jumps her Savage Cycle on top of the Tire and uses its claws to slow it down. The Rangers use their Savage Cycles to finish off the Tire Org. Toxica uses her magic beans to make Tire Org grow. The Rangers assemble the Wild Force Megazord to stop him, but meanwhile Princess Shayla has been captured by Jindrax and Toxica. They take her into the cave, where she is frightened to see Master Org. Master Org demands her to open the seal of the cave, because he knows only one of pure heart can open the seal. However, Shayla explains to him that the animal inside can only choose its guardian. Meanwhile, the White Ranger has come from the Megazord to Shayla's rescue. Master Org is furious and destroys the seal inside the cave. With a shake, Master Org disapears. Jindrax and Toxica are frightened and leave as well. The sounds of the elephant are still coming from the wall of the cave. The White Ranger reaches to wall where a light blue crystal appears. The crystal holds another Wildzord. The White Ranger places it inside her Crystal Saber and run outside the cave to see the mountain transform into the Elephant Wildzord. The White Ranger is charge of the Elephant. The Elephant charges and attacks the Tire Org. The White Ranger calls forth the Elephant to add itself to the Wild Force Megazord to create the Wild Force Megazord (Sword & Shield Mode). The Wild Force Megazord (Sword & Shield Mode) uses the Elephant Sword Cyclone attack and uses the shield to block Tire Org's projectiles. Then it powers up the sword to perform the Pachaderm Crusher attack, which destroys the Tire Org once and for all. Later at the Animarium Alyssa is happy about the Elephant. 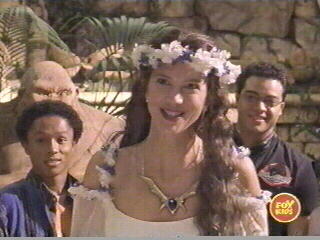 Princess Shayla tells them that 3,000 years ago, there were many Wildzords, but only five were put onto the Animarium. She never knew what happened to the rest. Maybe perhaps, there are others that have survived that are waiting for the day that they can be called on once again. Alyssa is reading a book about a girl who threw a bottle with a wish in it into Turtle Lake and her wish came true. During the story, Max falls asleep and has a dream that the Wild Force Megazord is defeated. He wakes startled by his dream, and finds Alyssa and Danny crying at what a beautiful story it is. Danny motions to Max what the story is about behind Alyssa's back. Max is delighted to hear about wishes being granted, but Taylor laughs at him and says it's just a fairy tale. Meanwhile in the Nexus, Toxica thinks that she smells a human and she looks into Master Org's chamber to see him moving his horn. Afterwards, Master Org comes out acting very strangely. Meanwhile by Turtle Lake, Max is upset because he thinks the other Rangers treat him like a kid. He then sees a bottle and writes a note and makes a wish. Later on at the Animarium, the Rangers are all alerted of the new Ship Org. Max instantly recognizes his bottle amongst the old boat parts. He doesn't want the other Rangers to know of his wish, so he is determined to get to it first. The Wild Force Rangers tackle the Ship Org, who proves himself very powerful. The Blue Ranger takes him on by himself and knocks him into the water, where he is knocked unconcious. A giant pair of eyes glow behind the Blue Ranger as he floats unconcious. Shortly after, the other Rangers find Max washed up on the shore. Not sure as to how he got there, they take him back to the Animarium to recover. The other Rangers return to the Turtle Cove harbor to battle Ship Org who has returned. Meanwhile in the park, Toxica tells Jindrax of her suspicions of Master Org. Meanwhile, Max has the dream again where the Wild Force Megazord is defeated and he falls to the ground with his Crystal Saber. There is a voice that tells him to use the Spear of Pardolus. Max awakens and tells Princess Shayla of his dream, but he can't remember the name used in the dream. He morphs into the Blue Ranger to help his friends battle Ship Org. Together, the Wild Force Rangers use the Jungle Sword to destroy Ship Org. Just then, Toxica, who has also showed up with Jindrax and the Putrids, makes Ship Org grow. The Wild Force Rangers call upon their Wildzords and combine them to create the Wild Force Megazord (Sword & Shield Mode). The Wild Force Megazord attempts to attack with the Pachyderm Crusher but it isn't powerful enough and Ship Org knocks them to the ground. The Elepant is knocked out of the formation. Meanwhile inside the cockpit, the Blue Ranger is reliving his dream and he hears the voice again. Princess Shayla hears him and tells him that the Spear of Pardolus was the weapon of a warrior who had one of the great Wildzords. The Blue Ranger calls upon the Spear of Pardolus which sends him another crystal for his Crystal Saber. The Giraffe Wildzord awakens to his command. 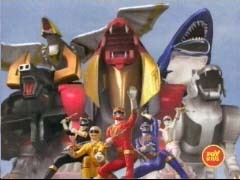 The Blue Ranger replaces the Shark with the Giraffe to create the Wild Force Megazord (Spear Mode). The Wild Force Megazord (Spear Mode) uses the Giraffe Spear to fire a blast that breaks through the Ship Org's shield and destroys him. Later on, Max finds his wish that reads "I wish the other Rangers would treat me like an adult." Danny comes up behind him and gives him a new bottle and the two of them watch as Max throws the bottle into the water once again. Taylor is out for a job by the air force base she used to work at, when she remembers back when she was on one of her missions. She in the sky in a jet fighter, when she spots the Eagle Wildzord flying in the sky. She tries to radio about it, but no one else can pick it up on sensors. Her transmission is cut off when she flies over a flying island, the Animarium. "The Animarium" is a child's story. She responds that she knew that it existed. All of the sudden, her jet goes crazy and she is forced to bail out over the Animarium. Once there, she meets Princess Shayla who tells her that the Eagle has chosen her to become the Yellow Ranger. While Taylor is standing outside the base, she sees one of the guards chase out two young boys that were in there. When the guard sees her, he says she reminds of him of Taylor Airheart, the best jet fighter pilot they had. Meanwhile on the Animarium, the Rangers are alerted of the Cell Phone Org who is in the plaza trying to steal cell phones to increase his power. Shayla alerts Taylor of the disturbance and she morphs into the Yellow Ranger to stop Cell Phone Org. However, Cell Phone Org uses his antenna beam to demorph Taylor. Cell Phone Org goes for her Growl Phone, but she takes it and runs. 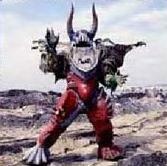 He chases after her, but runs into Jindrax and Toxica who offer him a chance to take on the other four Rangers. Cell Phone Org uses his antenna to create a force field jamming the Growl Phones, so the Rangers are unable to morph. When the other Rangers show up on the scene, they are quickly demorphed by Cell Phone Org's antena beam. Meanwhile, Taylor is badly injured and is hiding from the Putrids, when the two young boys from earlier show up again. The young boys use a super energy to nuetralize the Putrids and send them retreating. Taylor faints, but they heal her with their powers. Meanwhile, she dreams about the first time she saw the Animarium, when she was on a plane as a little girl. When she awakes, Taylor is amazed by their power and follows them to another dimension, where they she must climb down a mountain and pick two flowers for them. Meanwhile, Rangers are able to trick Cell Phone Org and destroy his antena. The Growl Phones' power have been restored. The Yellow Ranger returns to them to help them destroy Cell Phone Org by forming the Jungle Sword. Jindrax and Toxica show up on the scene and give the Cell Phone Org new life as a giant. The Rangers form the Wild Force Megazord, but Cell Phone Org has restored his antenas. 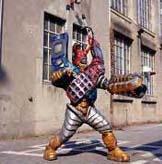 The Cell Phone Org overloads the Wild Force Megazord with its jamming beam. Just then, the Yellow Ranger spots the young boys on the ground. They use their power to give Taylor two more Zord crystals. They transform the young boys into the Bear Brothers. The Bear and the Polar Bear Wildzords are reborn. 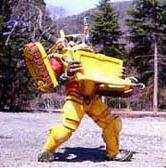 The two Bear Zords take Cell Phone Org's antena out and offer their help to the Wild Force Megazord. The White and Blue Rangers detatch the Tiger and Shark Wildzords and the Bear and Polar Bear Wildzords take their place to form the Wild Force Megazord (Double Knuckle Mode). The Wild Force Megazord (Double Knuckle Mode) knocks its fists together and uses the Bear Blasters to blast two sonic energy waves, destroying Cell Phone Org once and for all. Inside the cockpit, the Wild Force Rangers celebrate the Bears and their victory over another Org, when all of the sudden the Megazord begins to lose power. The Wildzords are flung apart by the Bear and Polar Bear. The Lion Wildzord is badly damaged. What is wrong with him? The Red Ranger looks up at his fallen comrad. He doesn't look so good. Cole promises the Lion that he will find a way to make him better. That's when Princess Shayla shows up with a solution. She sends the Wild Force Rangers into the forest in search of the legendary Soul Bird. The Soul Bird is known as the one who can heal the Wildzord. While in search of this bird, Master Org is alerted of it and sends Jindrax and Toxica to find and destroy it. While the duke Org are in the forest, they encounter Bulldozer Org and recruit his help to stop the Rangers. Toxica uses her magic seeds to make Bulldozer grow into a giant. The Red Ranger doesn't want the Lion to fight, but the Zord insists. First they form the Wild Force Megazord, but that is not anywhere near powerful enough. Then they desperately try to form the Wild Force Megazord (Double Knuckle Mode). However the Lion is too weak and the form is lost and the Bulldozer Org damages the Lion further. While the other Rangers and their Wildzords continue to fight against the Bulldozer and the duke Org, the Red Ranger goes in search of the Soul Bird. The Red Ranger finds the nest of the Soul Bird, but encounters Master Org who is there to destroy it. The Red Ranger and Master Org endures in battle against each other, but Master Org is too powerful. Cole falls to the ground and his picture falls beside him. Master Org picks up the picture and looks at it. Looking into the picture, immediately brings back a disturbing memory to him. He remembers chasing two explorers through the woods who carries a baby to safety. This is undoubtably Cole's parents. When we see Master Org break in on them in their tent, we can see he was once human, but he has mutated beyond this point. Cole's father points out that the man has taken the seeds which seems to have mutated him. The story behind these seeds is unknown to me at the moment. Luckily, Cole's mother is able to hide Cole before Master Org destroys his parents. Master Org looks up from the picture and relizes that Cole was that child. Cole unaware of any of this jumps into the air over past Master Org and takes his picture back. Master Org is ready to claim victory over his enemy, when he suddenly sees something behind Cole and disapears. But not before he destroys the Soul Bird's nest. Cole sees a shadow over him and when he turns to look a sees a green crystal orb descend into his hands. The Red Ranger joins the others as he unleashes the power of the new crystal to awaken the Gorilla Wildzord. The Gorilla uses his primate like abilities to attack the Bulldozer Org with full force. The Gorilla uses banana bombs to show the Bulldozer who's boss. With the power of the Gorilla Wildzord on their side, the Wildzords agree its time to form a new formation. The Bear, the Polar Bear, the Eagle, and the Bison combine with the Gorilla to create the Wild Force Kongazord. 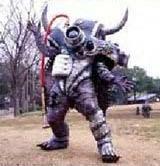 The Wild Force Kongazord is tough and uses the Vital Strike to anihilate the Bulldozer Org. After the fight, the Rangers look upon the place where the Soul Bird once resided, when they mysteriously find a big purple egg. So will the Rangers be able to take care of the Soul Bird's baby?